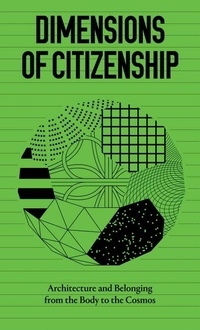 Globalization, technology and politics have altered the definition and expectations of citizenship and the right to place. Dimensions of Citizenship documents contributions from the seven firms selected to represent the United States in the 2018 Venice Architecture Biennale. This highly readable, visually led paperback volume profiles and illustrates each of the US Pavilion contributions and contextualizes them in terms of scale. Drawing inspiration from the Eames' Power of Ten, Dimensions of Citizenship provides a view of belonging across seven stages starting with the individual (Citizen), then the collective (Civic, Region, Nation) and expanding to include all phases of contemporary society, real and projected (Globe, Network, Cosmos). With contributions by Amanda Williams and Andres L. Hernandez in collaboration with Shani Crowe; Design Earth; Diller Scofidio + Renfro, Laura Kurgan and Robert Pietrusko, with Columbia Center for Spatial Research; Estudio Teddy Cruz + Fonna Forman; Keller Easterling; SCAPE; Studio Gang; exhibition curators Niall Atkinson, Ann Lui, Mimi Zeiger; and others. The book is published with seven different covers.